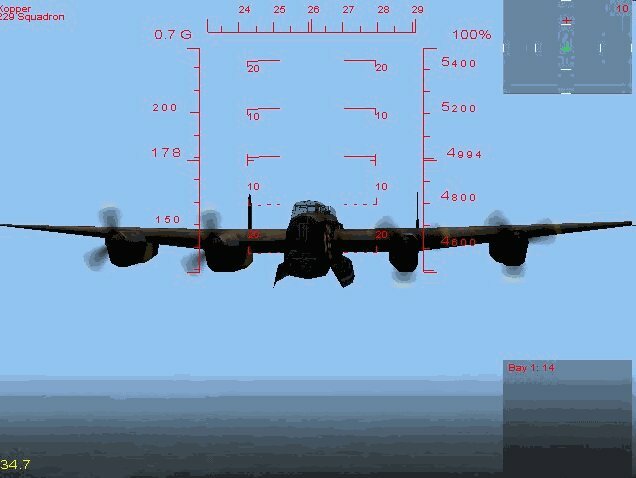 This example is using mission ‘bomb practise 10000.’ In this mission you are attempting to bomb Ramsgate on the south coast of England from an altitude of 10,000 ft at a speed of approximately 175 mph. Figure 1. This screen print was done at an altitude of 5,000 ft.
At 5 miles out commence preparations for your bombing run. Turn on auto pilot (p key) switch to the bomb aimer position (F7) and take control (F6). 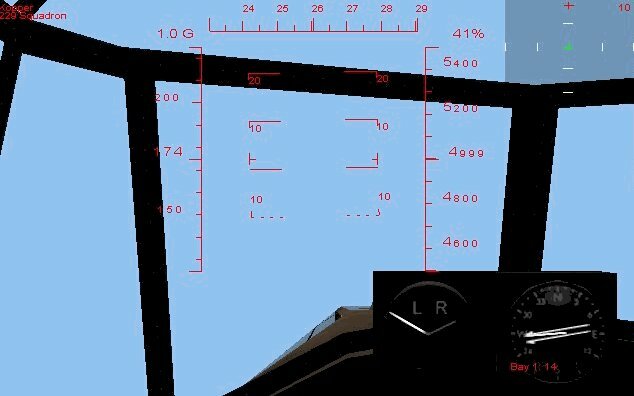 Do this quickly because the autopilot always tries to turn the aircraft around. I haven’t figured out why yet. Open the bomb bay doors (d key) you can here the whine of the motor to open the doors, arm your master weapons (a key) and select the bombs (6). Do an external view to check the bomb bay doors are open. Switch your map to the 5 mile range (r key). See figure 3. Once you are in the bomb aimer position only make minor corrections to your course from here on in. When you are moving your joystick to make corrections you are actually flying the plane. 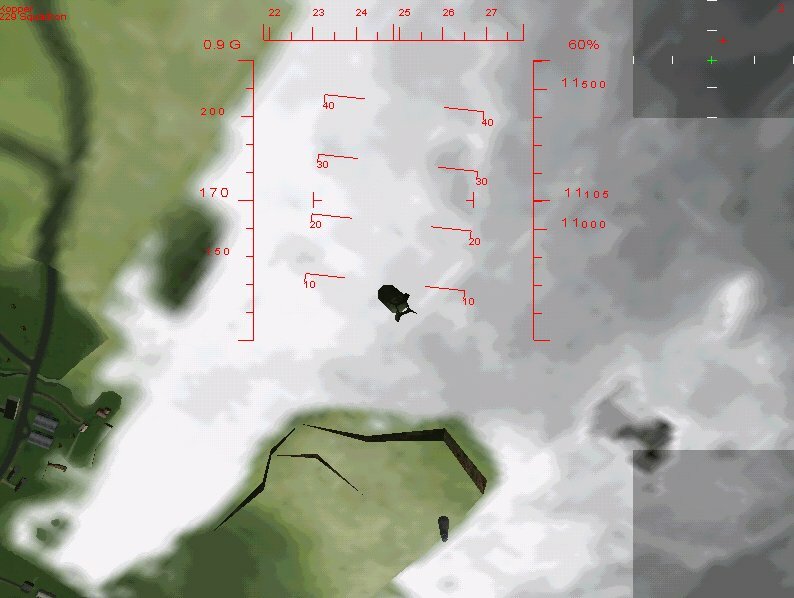 It’s hard to make corrections because if you bank to port the bomb sight view moves to the starboard. 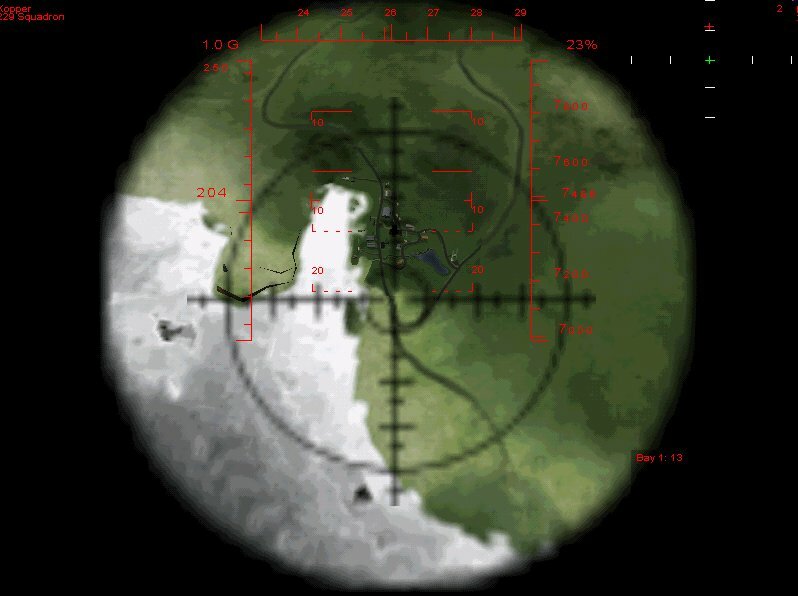 Use your hud for reference when doing this not the visual view through the bomb sight. Try to keep your speed around 175-195 mph. When is the correct point to release bombs? This will always depend on height, speed and winds. This is where I have the town in my sights when I released the bombs. From the outside this is the approximate position of the aircraft when you release bombs. Or you can go into slew mode (s key). To move around in slew mode you have to use your joystick or the keyboard equivalents for the joystick. Or you can hit the external view (F2) and move above your craft to view the hits. How close do the bombs have to hit to cause damage to the target? Good question, in figure 7 you can see where the bombs hit including one in the bay and I scored over 500 points and 7 buildings destroyed. It wasn’t enough to give me a ‘you win message’, but good enough to cause damage. Figure 7. Hits appear wide, check out the one in the bay. At this point you can leave the mission and see the summary. Warning when you do destroy buildings and not get the ‘you win’ message the mission debrief will say you need more practise. My guess is we will have to bomb from high altitudes. Why? 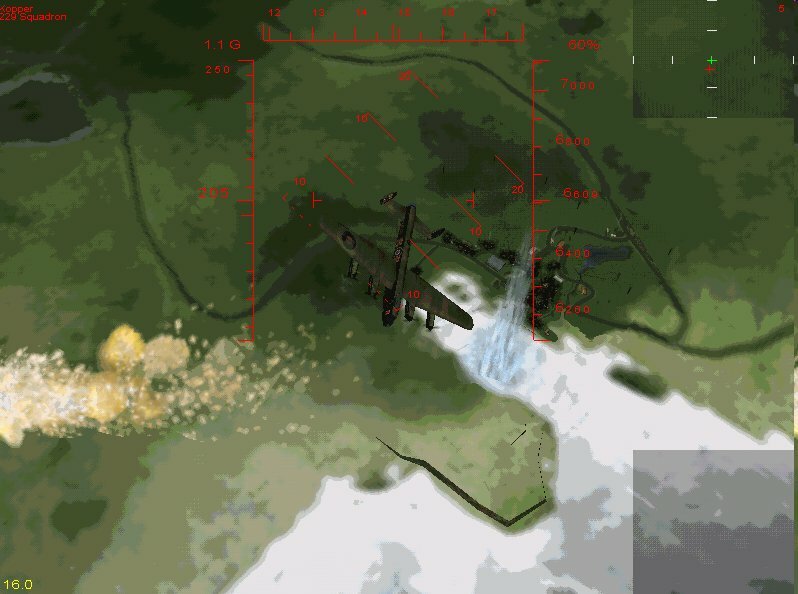 This way it will take enemy aircraft some time to climb to our altitude. 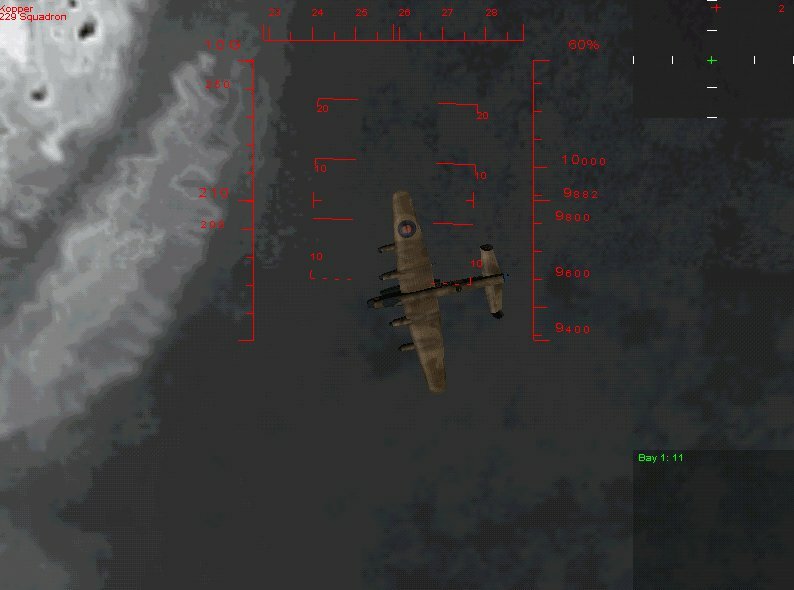 I tried bombing at 3,000 ft and less. Somehow at this altitude when the bombs hit the ground the explosion also destroys the plane. Get proficient at 10,000 then 15,000 then 20,000 ft. My take is whenever possible bomb at 20,000 ft. Don’t be discouraged if you don’t hit the target first time out. It took me 15-20 tries before I could hit the target 3 times in a row. Now don’t forget this mission has no winds.